I’ve been in Thailand for nearly a month now and spent the entire time on Koh Phi Phi Don Island. I love it! Don’t get any romantic ideas of a quiet, remote village surrounded by beautiful sea, mountains and jungle à la Leonardo DiCaprio in The Beach. 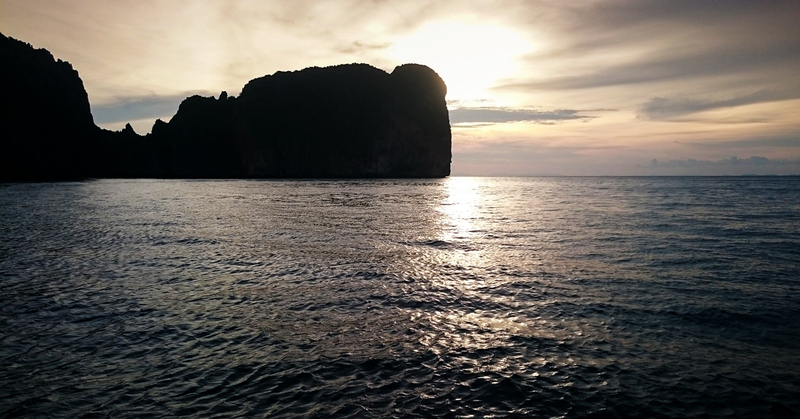 It was up until The Beach was filmed here and now it’s a tourism and scuba diving magnet with a big party scene and it’s more expensive than most places in Thailand. It is however surrounded by beautiful sea, mountains and jungle and still has its own soul and vibe. The people that live on Phi Phi tend to be very helpful and smiley. Everything and everyone moves at their own pace and locals still seem genuinely curious about people that come to stay on Phi Phi for a while. I think the place is just on that fine line of being big enough to be able to handle dozens of boat loads of tourists everyday while still maintaining a local community feel and mentality. Oh, and it really is a spectacularly beautiful place. The town is built on a sandy beach between two tall limestone ridges and is less than two meters above sea level. On both sides are semicircular bays lined with beaches. Tonsai Bay on the south side of town is crowded with longtail and other water vessels. Nice to look at but generally not great for sunbathing and swimming. On the north side is Loh Dalum Bay and it’s the place to be for swimming, paddling, sunbathing and of course, partying. During the day it’s fairly quiet and chilled while it night it bursts to life with beach bars and clubs. Since I’m diving almost everyday starting at 7am I haven’t been seeing much of the partying side of Phi Phi. We mostly have a beer at work in the evenings then head to one of the more chilled out places for one or 2 more before bed. If you plan on visiting and you’re looking for chilled out drinks that don’t cost a fortune head to The Sports Bar, Relax Bar or the only rooftop bar on Phi Phi, Banana Bar (also one of the diving communities favourites). If you’re looking for a more lively scene then start at Dojo and Stockholm Syndrome and when they close head to the beach and somewhere like Slinkys. In less than a month I’ve stayed at 3 different bungalows/rooms. If you’re staying more than a month there’s a huge range of accommodation options and not very much useful information on the internet to help. My first place was towards the back of town (10 minute walk to work) and cost 9000 Baht per month. It was one room, had a private bathroom and a fan but no hot water and toilets that are flushed manually using a bucket of water. Despite being a hot and dark room it was fine until the rain came. Then it turned into a dank, leaking puddle cave with new layers of mold growing daily. Any lengthy exposure to mold can be really really bad for your respitory system. Not cool if you dive very day. Time to move! Next was a 10000 per month place 2 minutes from work. Complete with hot shower, flushing toilet and a little fridge I thought I’d hit jackpot when I inspected the room. It was bright and spacious compared to my previous room but they had used a heavy amount of cleaning products which I didn’t like but I figured at least that meant they had just cleaned the room. Turns out they had just covered up the smell of mold. One nights stay revealed everything was riddled with mold. Even the pillows smelt like mold. Time to move! Only this time the manager refused to give me back my months rent. She wouldn’t move me to a new room either. After hours of arguing I decided my health was more important than 10000 Baht so I moved out anyway. A word of sincere advice if you’re coming to Phi Phi, do not stay at K House! I’m now in a 10000 a month place which is dry and clean. I have a hot shower and flushing toilet but dear god I miss having a fridge. Oh well.. can’t have everything. 4. Always check the room for damp. Lots of rooms are really unhealthily damp so if you smell or see it walk away no matter how good the deal is. If you’re staying for a few days, Trip Advisor is definitely worth a visit to find your accommodation options. If you have any questions please just shout using comments below or use my contact form. Yep, so I eat out everyday, 3 meals a day. It’s my least favourite thing about living on Phi Phi. I miss being able to make myself a simple sandwich or quickly scramble some eggs the way I like them. Since everyone eats out all the time there is (thankfully!) quite a a lot of variety and options. My personal favourite is Grand PP Arcade. Breakfast, lunch or dinner, the menu is relatively small but the food is perfection, prices are reasonable and the owners are lovely. It’s possible to eat out for less than 60 baht a meal but more realistically you’re looking at between 100 and 200 baht a meal. I’ve started putting together my top 10 restaurants on Phi Phi Island here. Breakfast at work. I love working next to PP Arcade. My wallet doesn’t! The Bida Islands. Bida Nok and Bida Nai. 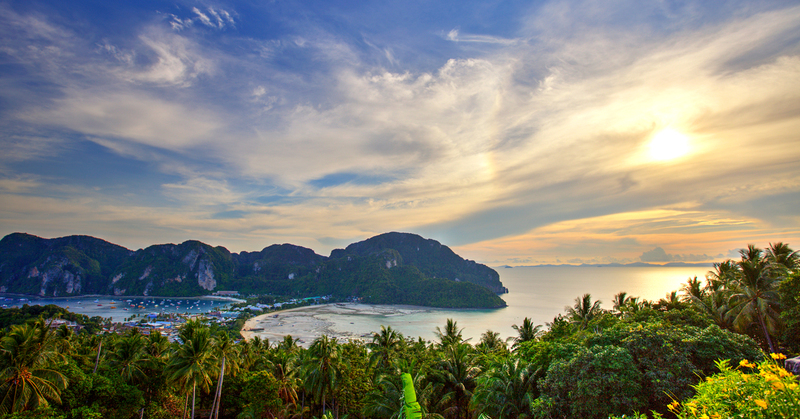 Wow – Phi Phi wasn’t on my list of destinations while in Thailand, but it might be now! My pleasure. It’s definitely worth a visit for a couple of days! Shout out if I can help with anything. Very good. Glad the suit swap is going so well. 🙂 Cheers. Quite the experiences with the mold, wow. But health is so much of an importance. Hi Ben! Love your decision to hit the road, I am getting ready to do the same thing! 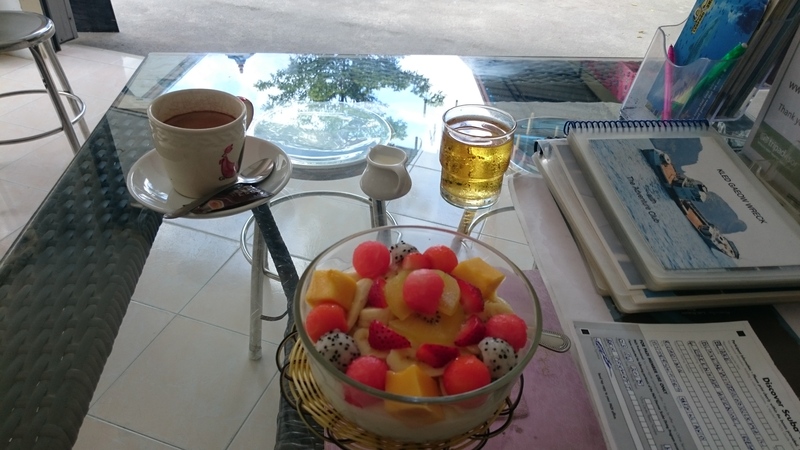 Im planning to do my divemaster internship and hopefully instructor certs in Thailand next year and i am looking for some adivce if you have time…. So i see you worked in Phi Phi for wa while, I am considering there and Koh Tao. Any thoughts on which is better? I know koh Tao is a little bigger and busier, my only concern with Phi Phi is less opportunity. I would like to stay and work as an instructor for a bit if I can. How difficult was it to get a job as an instructor? Did you have a position before you arrived or just found one there? Also, I was planning on arriving in March to start my DM training but I believe that is getting towards the end of the high season. Any suggestions on best time of year to go? I have a flexible schedule, I could wait until later in the year is that is more ideal. Thanks in advacne, I would appreciate your input!! Apologies for the delay but I want to give you a proper thought through reply. Bare with me and I will have one for you on the next few days. Sorry again. In regards to your DM internship, there are many great opportunities in Thailand. The most obvious being Koh Tao. I’ve not dived in there but I worked with several people that did DM training and the IDC there. From the small amount I know my advice would be to really do a lot of research with any company that offers you an internship. There are good and bad companies and the bad companies have started to give Koh Tao a bad rep with some people. Make sure they have a really good reputation because for some dive shop managers just the name Koh Tao makes them cautious about how good your training has been. That said, the people I worked with that did their training there were good instructors and had no complaints about the training they received. You’re right to think that the opportunities are a bit less on Phi Phi as it’s smaller and has fewer dive shops you will be able to intern with. It depends what you want really. Phi Phi has much better diving in terms of marine life but both places are party towns full of tourists and have a big local diving community. In Koh Tao I think you’ll get more exposure to actually teaching people to dive where in Phi Phi you’ll have more opportunity to guide groups as a DM. In either place you choose the most important decision will be if you work for free in return for your internship or if you pay to do DM and intern or do paid work once qualified. You might not have a choice here but if you do I’d personally recommend the latter. Everyone has a different view point here but personally I feel there are too many operations willing to take advantage of DMs interning for free. If you take this route be sure you agree the terms carefully or you might find yourself working out of the water far far more than in. I can’t give much advice on when the best time is to go to Koh Tao but on Phi Phi I’d say if you can start your DM Internship before high season and qualify at high season you’d increase your chances of getting a job. In that regard if you aim to qualify in November you would be fine. Hope that all makes sense and is useful.